If you can spare 600 seconds, you can train your biceps to exhaustion. Fitness expert Greg Plitt, inventor of the Metaball Fitness System and cover model to more than 250 fitness mags — including multiple M&F issues — has provided us with his tortuous, 10-minute arms shocker. Run through all four exercises of Plitt’s arm’s blaster for the desired number of reps without resting between movements. After the final exercise of the first set, rest for one to two minutes and then go through the workout again in reverse order. “Set it all up before you start so there’s no need to stop and adjust the weight,” he advises. “Use your rest period to reset everything for the next set. Expect to use about half the weight and execute half of the number of reps as you did in the first set.” All we can say is, good luck. Placing your hands wider than shoulder-width works the inside, or long head, of the biceps; a grip inside shoulder-width works the short head. For this exercise, use a wider-than-shoulder-width grip. Plitt’s tip: No swaying, no cheating. The goal is to put on mass, so make the biceps do all of the work and use a weight to which you can lift 10 times until you fail. Never sacrifice form or speed for more weight. Instead of performing a traditional seated EZ-bar preacher curl, flip around and put your chest on the sloped pad so the pad rests under your armpits. Remove the seat if you can. If that’s not an option, adjust it so it’s as low as it goes. Alternatively, if no preacher curl station is available, sub in an incline bench. Plitt’s tip: Use an inside shoulder-width grip and keep your triceps, chest, and armpits squarely on the pad to remove the option to cheat. Hold a dumbbell in one hand. Get into an athletic stance, bend down and do not allow your back to round when you perform the curl. Plitt’s tip: Do not put your elbow into your knee like you typically would when doing concentration curls. Step onto a resistance band, grab the handles, and start reaping out curls as fast as you can. 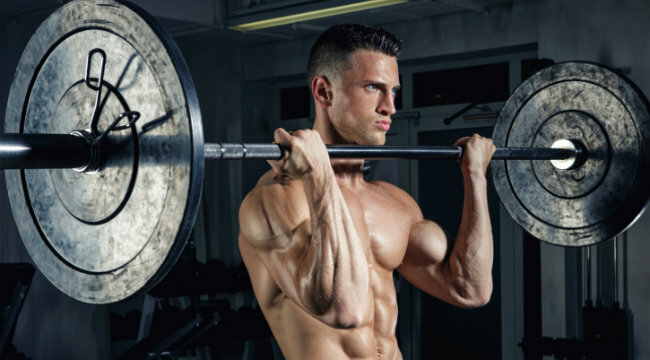 Plitt’s tip: You’re alternating left to right and doing mini uppercuts at the end of the curl to change the angle of the movement —but it’s not a shoulders or back exercise.